Dissolve has been one of our original formulas since we began our business in 2007. It is a long process but is definitely worth it. Duke's Lipoma measured over 7 inches, and was impeding normal movement. Our all natural plant based Chinese herbal formula Dissolve has anti inflammatory and blood moving herbs in the formula, which we see helped Duke improve over all. Dave also changed Duke's diet and began feeding fresh food which helped him improve. Thank you Dave, for sharing Duke's experience with our Dissolve formula. Duke is a 14 yr. old Australian Shepard what had a 7-1/2 inch tumor and could hardly walk and had to pull himself up steps, After following instructions on bottle and feeding fresh food after using the three bottles I ordered the tumor has shrank to about 2 inches and went from being hard and infected to very soft, Mostly just loose skin. I just reordered 3 more bottles and am expecting it to be totally gone,. Duke is now running , jumping and back to work as a farm dog. Great product. Want to learn more about our Dissolve formula, click on the link below to go to our website. Heart conditions are expressed through multiple symptoms. Usually the symptoms that will be noticed in a dog that has a heart condition are the following: dog cough that may seem worse after sleeping, excessive panting, and chest water. 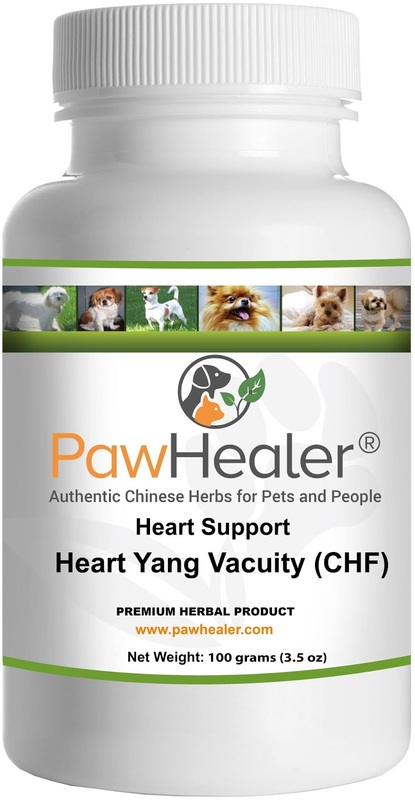 Our Heart formula Heart Yang Vacuity CHF can address the root causes of the heart condition; however our Heart Syrup will address the branch causes such as gagging and wheezing. These formulas are a great natural alternative to prescribed medication. Our formulas are all natural plant based Chinese herbal formulas., they can be combined together or given separately. 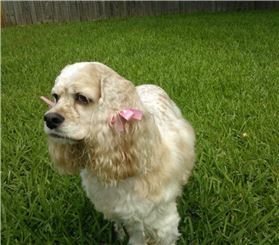 Tammye shares Taffy's experience with our formulas and at 14 years old she is looking great. Our formulas have given her more relief compared to medication prescribed by her veterinarian. 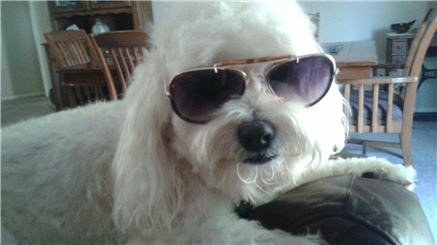 Thank you Tammye for sharing your experience with our products and this adorable picture of Taffy. "My cocker spaniel was born with a heart murmur. She is now 14 years old and experiencing congestive heart failure. The prescriptions from the vet were not doing enough for her cough and congestion. I researched multiple sites and found Paw Healer. I filled out the questionnaire to find the best combinations. I use Hound Honey Heart Syrup and Heart Yang Vacuity (CHF). This combination gives her more relief from cough and heart congestion than what I was using alone that was prescribed. I will continue using these together to help her as long as I can. I know her days are numbered but this will help her in the meantime from so much suffering. I highly recommend these products. The hound honey does not last as long as the powdered herbal products so I recommend buying two of these with each powdered herbal products. I know I am doing all I can for her by adding these products. Thank you Paw Healer! You've given my dog a little longer to be with me." click on the links below to go to our product page on our website. 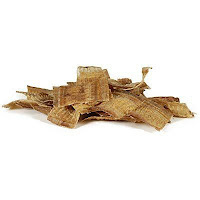 Many dogs develop fatty lumps which in Chinese herbal theory are referred to as "nodules". Nodules is a general term to describe the many different types of swellings, masses, enlargements, hardness, lumps etc. These Lipomas are a type of benign tumor, located mostly at the superficial level of the skin. They do not appear over night therefore it is a long process for our Dissolve Herbal formula to show some improvement. Our formula is an all natural plant based Chinese herbal formula designed to dissolve fatty lumps. It can take up to 6 weeks to notice some gradual changes. As Carmen Turner states, it has been a couple of months, but the lumps have decreased in size. Thank you Carmen for sharing Tina's experience with our PawHealer Family. "Tina's fatty lumps have been examined by our vet who recommended an operation. Instead I chose to try Dissolve and have been using it for several months. The fat pockets have not totally dissolved but they are smaller in size. I will continue to use as long as I see results as anything to avoid surgery is welcomed. I only wish I could submit these prescriptions to my pet insurance." Want to know more about our product? Click on the link below to go to our Dissolve Herbal Formula product page, on our website. Thank you Terri for sharing your experience with us. A lot of the times one of the first signs of improvement with Dissolve is the attitude change in dogs. Our Dissolve Herbal Formula has anti inflammatory herbs and blood moving herbs. The combination of these herbs allows for an attitude change as one of the first signs of the formula working. In this case Zeus began to feel the difference within a week from starting the formula. Lipomas are a long a process to dissolve so it is a formula that must be administered routinely and patiently. It can take several weeks before noticing a gradual softening of the lump itself. We are very happy to hear that Zeus is noticing some results, with our Dissolve Herbal Formula. 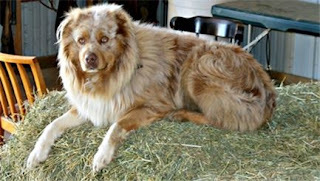 "I will translate for you Zeus's testimonial on this product: He received his first dosage in time for his 11th birthday last June and within the first week he got perkier..He is a runner, varmint disposer (rats, moles, squirrels, rabbits, feral cats) on the ranch here. He has his own animal chiropractor since he had been feeling the over-activity and then under during the winter months. Since he has been on this formula he has not had to visit his chiro.. He is still working on the dissolving of his lump but he stills outruns his man friend, Mike, when he is driving his side-by-side UTV. Thanks Dissolve..."
Want to learn more about our Dissolve? Click on the link to go to our product page on our PawHealer website. 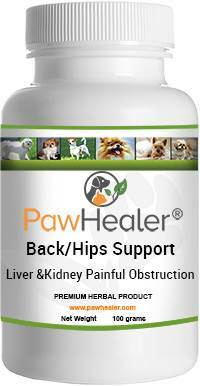 Our Back Hip Support Liver & Kidney Painful Obstruction Formula, is our go to formula for elder dogs with joint issues. These pugs have been on these formulas for a couple of months and have noticed a difference on their back legs. This is an all natural plant based Chinese herbal formula that is administered through the food twice per day, based on their weight. This is a great formula for older dogs with aches in the joints and weak knees. This formula helps those little guys that suffer from symptoms of arthritic pain, muscle loss as well as stiffness in the joints. To learn more about it, check out our product page on our Pawhealer website. Thank you Chholing for sharing your experience with our PawHealer Family. "I have two senior pugs, ages 15 and 12. Both have over all joint stiffness especially the hip and knees. This product has been a lifesaver for both dogs. My 15 y/o pug can now lay down without a struggle, and my 12 y/o pug has more stability in her legs." Want to know more about our product? Click on the link below to go to our product page! Lipomas show up on our Furry Friends, and they may not bother them, but they do bother us. Like Lisa tells us, we must have patience. This is a long process and it is something that must be administered routinely. Our formulas are all natural, plant based Chinese Herbals, with no drugs narcotics or steroids. Dissolve is one of our most selling items and has been for about 10 years. It is administered based on weight twice per day through the food. Remember a grain free diet is crucial. Thank you Lisa for sharing Chloe's experience with our Dissolve Formula! "Chloe is a 12 year old Pom and has a very large lipoma on her left rear hip area. We've been using the Dissolve formula for a little over 3 months now. The lump measured 7" across when we began and is now measuring 6". That's an entire inch in about 3 months time. It's a slow process, be patient. The lumps don't appear overnight and they do not go away overnight. But any improvements are a step in the right direction." Click on the link below to learn more about our formula on our website. A large lipoma near the esophagus can be a tough area to deal with. In this case Michelle decided to try out our product in August. Even though, it is a long process Michelle had hope and gave Bear the formula routinely. Within three months she has noticed the lump decrease and Bear's breathing improved as well. With our Dissolve formula Michelle was able to give Bear some relief. Dissolve is one of our most popular formulas that we sell on our site. It is an all natural, plant based Chinese herbal formula and a great alternative to surgery and western medication. Thank you Michelle, for sharing your experience with us! "Bear has a large lipoma near his esophagus. I have been using this product for about 3 months and the lump has decreased. He used to be a noisy breather when laying on his side, but he is quiet now." Click on the link below to learn more about the Dissolve product on our website. Thank You Michelle for submitting your testimonial. Michelle has been administering our Heart yang Vacuity CHF for a couple of months and noticed some improvement. This formula is designed for dogs that have an enlarged heart with the following symptoms: fluid in the chest excessive panting, and a cough that may be worse after sleeping. This is a powder that can be administered through the food twice a day based on weight. If you want to know more about this formula check out our product on our website. 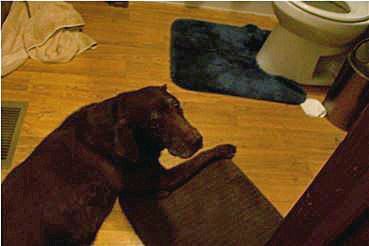 "My dog is feeling much better using this product." Click on the link to go to our website. 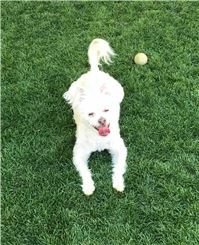 Nalana Has been using our Heart Yang Vacuity Herbal Formula for her little guy with an enlarged heart and collapsed trachea symptoms. Our herbal formula has coughing herbs incorporated into it to help both the heart condition as well as the collapsing trachea. Thank you Nalana for sharing your experience with our natural formulas for dogs. "My dog has been diagnosed with an enlarged heart and collapsed trachea. He has been using this product for a little while and he seems like he is having less choking incidents and his breathing not as labored." Read more about Our product by visiting our website...click on the link below. Jonah is using two of our formulas. 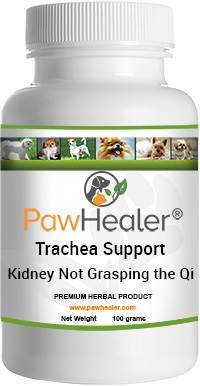 He is currently taking the Trachea Support Kidney Not Grasping the Qi as well as the Trachea Soother Syrup. As Mary mentioned we always suggest the natural alternative for any symptoms that your dog may be experiencing. Mary continuously administers our formulas and as a result Jonah feels great! "Jonah is an amazing boy but was diagnosed a couple years ago with collapsing trachea. Over the last couple years his coughing has gotten worse and so was his breathing. They questioned putting in a stint and I was thinking seriously about it when I started researching. During my research I ran across pawhealer and messaged with a gentleman who helped me a great deal and encouraged me to try the products before doing the stint. I ordered them and within a few days Jonah's coughing got better and so did his breathing. Just because I wanted to test it. After the first couple of orders I stopped to see how he reacted. His coughing and breathing seem to have worsened so needless to say I am a believer. I just placed another order and will continue to order. This is not something I will allow him to run out of anymore and I will also be looking to other products from pawhealer. Thank you for helping heal my fur baby you are so appreciated." Hound Honey Trachea Soother Helps Tucker's Cough! Tucker looks great at 14 years old. We are glad that our Hound Honey Trachea Soother has been able to help him. This Syrup is a concoction of raw herbs suspended in honey and dogs love the taste. Thank you Linda for sharing Tucker's experience with our Hound Honey Trachea Soother Syrup. "Tucker will be 14 in September and he has a cough but when he gets his cough syrup he does great. Thank you"
Want to know more about our product? Click on the link below to learn more about it! No more Cough for Paco! 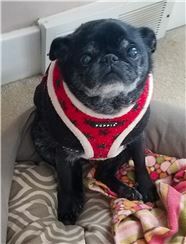 Paco has been using our Trachea Support formula since June 2018. This is a great formula for anyone looking for a natural alternative to medications given by veterinarians. This formula has helped many other dogs that like Paco, have collapsed trachea symptoms. Check out our website to read about other customer experiences with our formulas and learn more about our products.&nbsp;Thank you Yazmin for sharing Paco's experience with us. 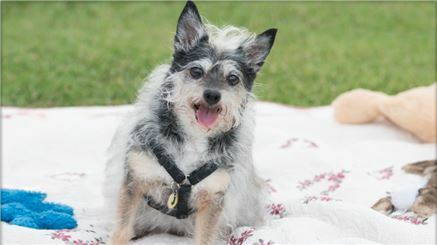 "Paco is my 10 year old mixed breed terrier. He began hacking and over the course of 6 months it got progressively worse to the point where he was hacking all day every day. At night he'd wake up hacking and had a lot of difficulty breathing. We took him to the vet several times and she gave him allergy meds. Paco has always had allergies but this was much worse and the meds and shots didn't work either. The vet told us that his trachea was collapsing, especially after eating, but there was not much to do about it. 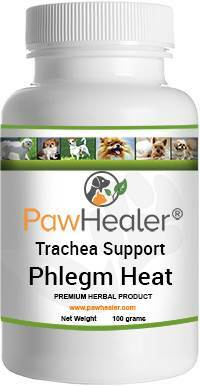 I found Pet Healer and tried the Trachea Support: Phlegm Heat Formula and within a few days I noticed a big difference. Paco now rarely hacks and when he does he doesn't suffocate or gag. It became more of a normal sneeze. I'm so happy about it!" Click on the Link below to learn more about our Trachea Support Formulas. Angel is Improving and is Pain Free! Donna has been administering one of our formulas that is great for dogs that have arthritis symptoms. She is giving Angel, our formula "Back / Hip Support Liver Kidney Painful Obstruction". This formula helps dogs with chronic hip and lower back stiffness, weak knees, and muscle loss. This formula helps relieve older dog aches and support muscle and joint movement. Angel has been using this formula consistently since February 2017. 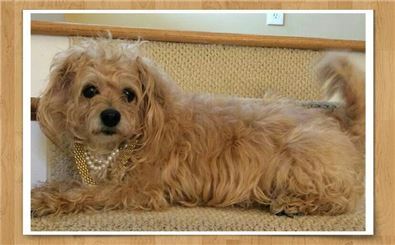 Thank you, Donna for sharing Angel's experience with us and our Pawhealer Family. "Angel has been using the Back/Hip Support for almost one year and has made big improvements in running and pain relief from arthritis. She is even jumping some again." Trachea Phlegm Heat Helps 14 year old Libby! Thank you Janice for giving us this wonderful review on our Trachea Support Phlegm Heat. We are so glad it has helped Little Libby with her collapsed trachea symptoms. This is an all natural plant based Chinese Herbal formula that we design and make in San Diego, CA. It is a great formula for dogs that have a dry hacking/honking cough, experience restlessness, as well as panting. 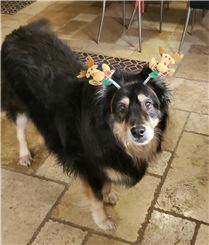 "Libby is my all time one dog that a person loves and is extra special above all others. She has so many problems including a collapsed Trachea that causes her to be distressed at times. Since I have been using your Trachea Support Phlegm Heat she very rarely has a problem. How do I know it works? When I stop giving it to her the symptoms reappear. Have recommended this product to many people and your website. 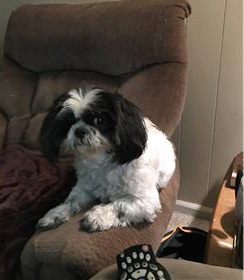 Libby is 14+ and at the end of her life cycle but she is still hanging in there and thanks to your products she continues to be comfortable." Read more about this formula on our website, by clicking on the link below. We are glad that the formula has helped. 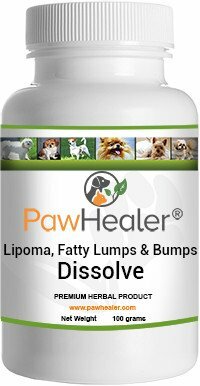 Our Dissolve formula is designed to help dogs that have fatty lumps that are all over the body. The Dissolve formula is one four off the shelf formulas that we have for Fatty Lumps and Bumps. Thank you, Kimberly for sharing your experience with us, we really appreciate it. 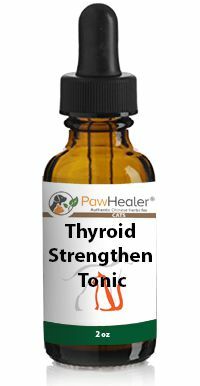 Our Thyroid Strenthen Tonic for Cats is one of many liquid herbals that we have listed on our website for our Feline Friends. These products are not just for cats they are also great for small dogs. This product here is a 2 oz glycerin based Herbal formula designed to help cats and small dogs with a Sluggish thyroid, Slow metabolism as well as with Hypothyroid. 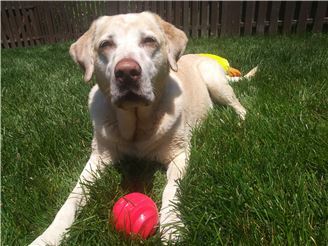 Thank you Sarah for sharing Fenway's experience with our product, we hope he gets better soon! Fenway was diagnosed with hyperthyroidism and the vet wanted to start him on a medication..I immediately came on pawhealer and searched up an alternative medication. So far he has been doing really well with it. Click Link below to visit our website and learn more about our Thyroid Strengthen Tonic for cats. Our 12 year old, 20lb. American Eskimo, Princess, definitely seems to have fewer and less intense coughing spells since we started the Trachea Support treatments.. She was diagnosed as having trachea collapse, but we are in the process of getting her x-rayed to be sure...... updates coming. Princess we are so happy your feeling better. Regardless if you have a collapsed trachea, or just coughing for unknown causes, Chinese herbal formulas can help manage all types of coughing. In the case of Trachea Support, we are clearing heat, moving blood, and using herbs that are known for their "stop cough" abilities. We look forward to hearing more about your progress. Managing a collapsed trachea is an on going endeavor, and we are happy we could help your human help you. Elvis Improved Using our Trachea Combo! Joanmarie Piazza gave us a great review on three of our products and our company! Thank you for your time and effort, we are glad that you found us, and that we can help you, as an alternative to the surgery suggested by the veterinarian. Our Trachea Support formulas are all very popular and have great results. All of our herbal products are natural plant based formulas. They can be bought as combo packs as well as individually. The powder is easily administered through the food twice a day. The syrup can be given three to four times a day and most dogs like the syrup because it is made in a honey base. The Trachea Chips are Beef Trachea that can be given as a treat and are a natural way to build up the Trachea cartilage, as well as great dental chews! Once again thanks Joanmarie for sharing Elvis' experience with our PawHealer Family, we are glad that he has improved and is feeling better. "My Yorkie Elvis suffers from Collapsing Trachea and our Vet had given up all hope for a cure except surgery. I just couldn't agree with that, surgery seemed like such a drastic solution. 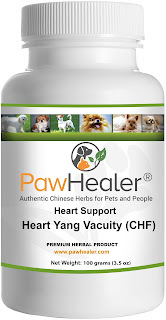 Read Paw Healers description of an herbal mixture which was very effective in treating CT. In fact, there was a 3 product bundle which treated all the symptoms, the terrible honking cough, the labored breathing, etc. 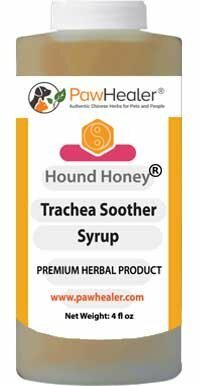 The 3 products, Beef Trachea Chips, Hound Honey Trachea Soother Syrup and the Trachea Support: Phlegm Heat Formula were very reasonably priced and I felt safe using an herbal solution rather than man made chemicals or surgery. I placed my order to a gentleman who answered all my questions and concerns and encouraged me to contact him anytime I needed. I&rsquo;ve been using these 3 products for about one month now, and I see a big difference in Elvis&rsquo; condition. His coughing is lessened, when he does have a spell, it is short and not as violent, his breathing has normalized and he has more energy. I am very pleased beyond words that my Yorkie has improved so very much without using dangerous chemicals or having to endure the surgeon&rsquo;s knife. 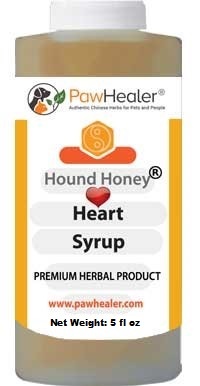 I just placed another order with Paw Healer and I intend to continue using their products as they are high quality and extremely effective and reasonably priced. Thank goodness for PawHealer, they saved my Elvis from suffering the wrath of a Collapsing Trachea. By the way, the products were accepted easily by my Yorkie, he took them without fuss and that made my job a whole lot easier. Can&rsquo;t say enough good things about PawHealer, except I am grateful I found them for Elvis!" Hound Honey Trachea Soother Helps Annie! 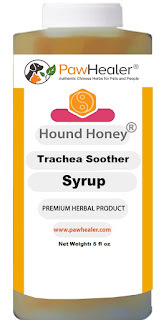 Our Hound Honey Trachea Soother Syrup is one of five Hound Honey Syrups that we have. It is an herbal concoction prepared with raw herbs suspended in honey. 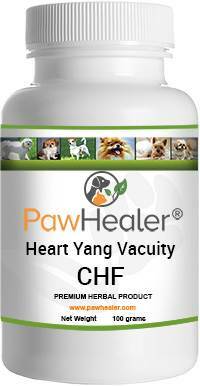 This formula is one of our most selling items within Pawhealer and is also an Amazon favorite. Deborah has found that Annie has improved while using our Hound Honey Trachea Soother Syrup. My little Annie has collapse Trachea and the Hound Honey Trachea Soother Syrup helps her cough better than anything else we have tried. You can go to our Hound Honey Trachea Soother page by clicking on the link below.